You can continue to utilize a PRI trunk while running a VOIP server and utilizing the SIP protocol internally. However there are several issues that come up due to this configuration. First, you will need a PRI box, that basically takes the PRI stream and converts it to digital for the server to understand. The hardware aside, this can become difficult to troubleshoot issues with calls from external sources as well as calls originating inside the system to external numbers. While the system will work internal extension to internal extension, external out bound/inbound calls may not, and can result in a line that is simply silent, presents a busy tone, or even rings and then disconnects. The end result is that your server is working, but we need to know why calls into the system from outside are not, and why the system can not call out of the network. We can check our Asterisk CLI and see if we can see the invite on an inbound call. If we do not, and we can successfully reach the internet, then we have an issue along the PRI. Rebooting of the PRI box will generally solve several connectivity issues, but the question is why? The simple answer is generally the provider of the PRI handoff has made some configuration changes and usually do not notify end users that there will be changes, and this requires the PRI box to reboot to connect back to the PRI trunk. Another common issue along the PRI line, is the handoffs card will go out, and a resulting call to the PRI provider generally results in the provider on the phone telling you they do not see an issue in the circuit, and will require a few hours of prodding to have a provider technician come to the site and change the faulty hand off card. At that point you will now need to login to the PRI box, and reboot it to bring the phone system back online and functional once again. When we utilize a SIP trunk, this is a direct internet connection and is already being transported digitally and is ready for the server to accept, with no other hardware conversions required. Your only issues that can arise in this situation would be a failed internet connection, or an issue with the SIP trunk provider directly. However the Sip Trunk providers use several fail over connections so this will be unlikely, and a configuration change from your ISP will not affect your SIP service. 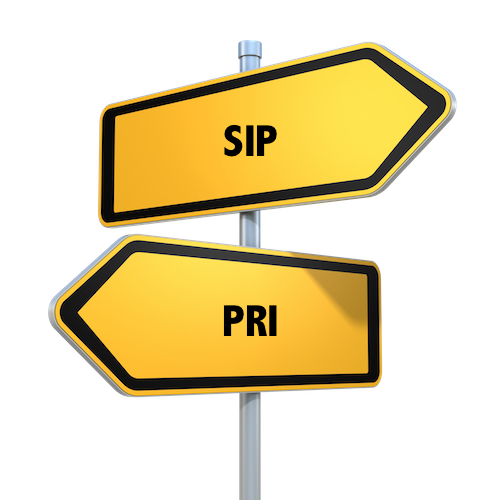 While the overall call quality will not show a difference, the troubles that can arise as well as the added hardware costs and extra configurations of a PRI box that are needed make a direct SIP trunk more economical in the end.